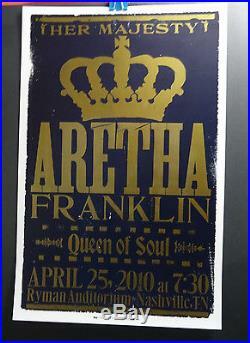 April 25, 2010 Queen of Soul Aretha Franklin Concert Tour Poster Ryman Nashville, TN, Hatch show print poster on heavy stock. Hatch Show Print has been in business since 1879 and I think the best posters in the Music business. The poster is 14 x 22 inches in NM condition with some minor storage wear around the edges, please check the photo. Mails in a Plastic (PVC) Top Holder packaged well so it will arrive safely and give you a safe way to store or display the poster. (Please see the photos). The item “2010 Aretha Franklin Concert Ryman Auditorium Nashville Hatch Queen Soul Poster” is in sale since Thursday, April 23, 2015. This item is in the category “Entertainment Memorabilia\Music Memorabilia\R&B & Soul\Posters”. The seller is “stargalore” and is located in Muncie, Indiana. This item can be shipped worldwide.